For a lead survey, lead paint survey or lead register YOU NEED US. LeadSurvey are the only 'total lead' specialists in UK construction. If you're not using us already, you're probably 'at risk' and non-compliant. LeadSurvey provides everything from pre-construction lead paint and dust survey information to end-of-project clearance testing and certification, including: training; consultancy; biological and environmental monitoring; and specialist products to support your in-house management and good practice. Whether you need to identify lead hazards or have already done so, as required by law, THE POSITIVE IDENTIFICATION OF LEAD IN PAINT, DUST OR OTHER LEAD CONTAINING MATERIALS (LCMs) SHOULD ALWAYS BE TAKEN AS A WARNING about likely ‘significant’ exposure risk and hazardous waste issues. Whatever the nature of your lead concerns our service is unrivalled. You can rely on us to provide all the expert advice and technical input you need to protect your people, projects, profitability & public relations. If you already have a lead paint inspection or lead test report, based on 'traditional' laboratory analysis, copy it to us and we'll talk you through it. At best, it's likely to be "unusable" for any meaningful risk assessment. At worst, it could be entirely misleading. If you want to be 100% sure, give us a call. As you'd expect, we deliver the most comprehensive capability available to those organisations and individuals working in refurbishment, decommissioning, demolition and related activities. On-site lead exposure risks are much more commonplace and far more toxic than is realised – in terms of health, programme, project cost, reputational and compliance risk. Lead hazards and exposure risks tend to be unexpected because of the widespread lack of awareness. You need quick information and answers before deciding on your next steps, so call us now to minimise potential exposure risks, programme delays and cost overruns. Whether your need really is URGENT, a little less so or you have time in hand, we can be as flexible as you need us to be. The POSITIVE IDENTIFICATION OF LEAD IN PAINT and DUST SHOULD ALWAYS BE TAKEN AS A WARNING about the likelihood of ‘significant’ lead exposure risks – whatever your method of testing or measurement. URGENT problems need urgent solutions, so give us a call before things start to get out of hand. YOUR WAY: Balance your priorities & your budget. Devise a proportionate response. Choose any combination of LeadSurvey’s unique range of specialist sampling and testing products, and XRF-i lead survey and measurement services, to ensure a proportionate and cost-effective approach to your lead risk management needs. Case study: In order to provide a cost-effective solution to a long-distance client, we were able to use our real-time analysis and reporting capability to generate site-specific lead survey findings ON THE SAME DAY that we provided follow-on lead awareness training, project risk review and SalivaCheck services. Our clients rely on our unique expertise and capability to deliver dedicated support at every stage of the built asset life-cycle - from CDM pre-construction lead survey information to end-of-project clearance testing and certification. For organisations operating in the refurbishment, decommissioning and demolition sectors, on-site lead exposure risks are far more toxic than is realised – in terms of health, programme, project cost, reputational and compliance risk. Our XRF-i-based lead survey approach outperforms the traditional method of laboratory paint flake analysis. It overcomes the problems associated with limited sampling, poor sample quality, extended reporting times and the inevitable risk of dangerously under-estimating actual on-site lead hazards 'as found'. Failure to address these shortcomings has serious implications for employers, workers and their families, building occupants and the environment. XRF-i lead surveys provide, without question, the most reliable results for properly evaluating on-site lead hazards, their potential exposure risks and hazardous waste implications. LeadSurvey's unrivalled ‘real-time’ reporting capability puts you, the client, in control of your risk management obligations from the moment we arrive on your site. LeadCheck® kits provide a quick and easy, low cost ‘DIY’ self-test to give you an initial indication of the presence of lead-based paint. 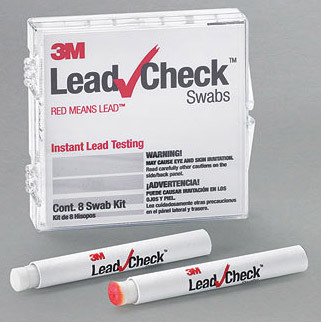 WARNING: LeadCheck® kits should only be used as a preliminary'screen' or indicative test. They do not produce conclusive results. Although useful to identify areas for 'paint on surface' sampling and subsequent off-site analysis, they do not satisfy the legal requirement to quantify lead hazards on commercial projects. If you can send us ‘paint on surface' samples (which may have tested positive already with a LeadCheck® kit) we’ll provide rapid analysis, presented in a summary report. This will provide information to help you start to consider everything from: treatment, removal and remediation options; to exposure risks and work methods; hazardous waste management and site clearance issues. ON-Site XRF-i lead surveys are the only way to determine the full extent and variability of lead paint levels on a project. Portable XRF-i analysis lends itself to testing 100s of areas in a fraction of the time you’d need to obtain enough paint flake samples for ‘traditional’ laboratory analysis. If you want ‘suitable and sufficient’ data for robust risk assessments, portable XRF-i lead paint surveys are the answer. IF YOU HAVE A LEAD PROBLEM YOU NEED TO KNOW HOW BIG IT IS. That's when you need to give us a call. If you can explain the background to your particular situation, we can talk you through the most appropriate way to proceed. If there is an immediate exposure risk to your workforce, or there are others in the vicinity who could also be affected, EVACUATE IMMEDIATELY. IDENTIFY & ISOLATE OR CONTAIN THE SOURCE OF EXPOSURE IF POSSIBLE. A thorough decontamination and clean-up of personnel, property ad equipment should then follow.